the shoreline. . . . Hikers can stroll along the beautiful creek trail and see a variety of birds . . . "
Hikers can also see a bunch of free-ranging cows beside the lake! 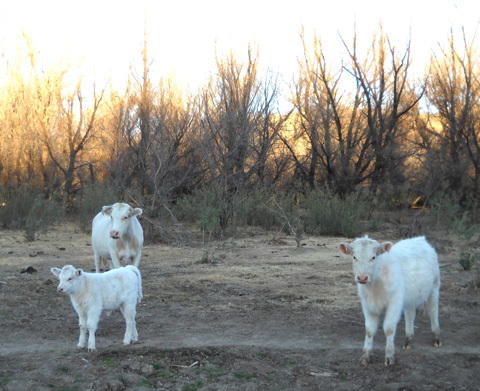 We knew about the abundance of fish and birds in the area, the deer, coyotes, javelina, bobcats, mountain lions, and rattlesnakes -- but we weren't expecting the cows. And that's one of the things that makes exploring an area that is new to us so much fun: little surprises! The only "Patagonias" that have been on our radar screen until recently are the scenic region at the southern tip of South America and the outdoors sporting goods company bearing the same name. 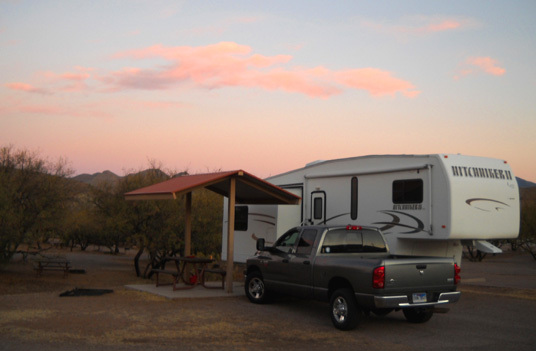 We didn't notice there is a Patagonia, AZ until reading an article about the area in an RV blog last fall. The author lists it as one of his favorite boondocking (dry camping/without hookups) locations in the spring and fall. The area's ~ 4,000-foot elevation makes it a bit chilly in the winter but we decided to check it out on our way back toward Texas after Run to the Future. Weather forecasts looked as favorable as those in the Phoenix area, so why not? Although temperatures were in the upper 30s in the mornings, the afternoons were sunny and above 70�F. while we were there this weekend. We lucked out with higher-than-average early January temps. No wonder sunbirds, both human and avian, migrate to southeastern Arizona in the winter! 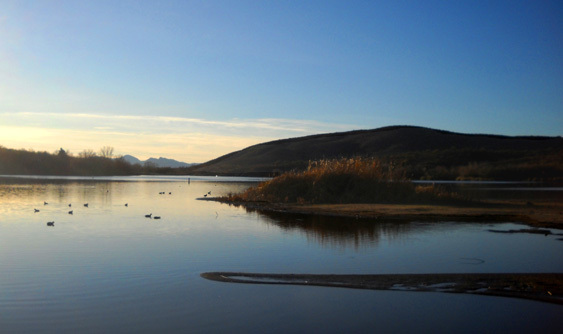 A view of Patagonia Lake from the state park campground. 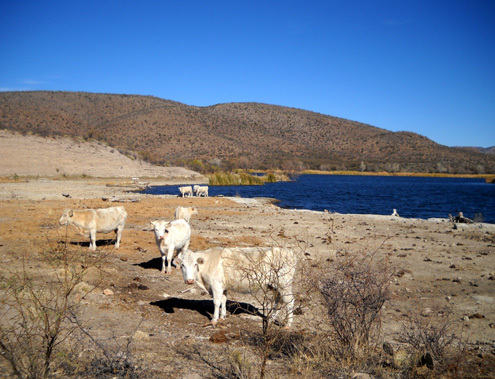 The little town of Patagonia, located about twenty miles north of Nogales and the Mexican border, was originally settled at the end of the 19th century as a supply center for local ranches and mines. Many former mines still dot the region. Fewer than a thousand people, some of them retirees, now live in the town. Tourism and ranching are the primary means of making a living here in the 21st Century. Visitors shouldn't come to Patagonia expecting a resort-type experience -- quite the contrary. It's very low-key and surprised us with its simplicity. The town reportedly has an active arts and crafts community; several art studios are open to visitors but we didn't have time on this brief trip to go into any of them or to check out any of the local restaurants. We probably would have enjoyed our visit more if we'd done that. We talked to one military retiree doing laundry at Ft. Huachucha who makes the 40+ mile drive to Patagonia just to eat at one of its little restaurants. Must be pretty good! 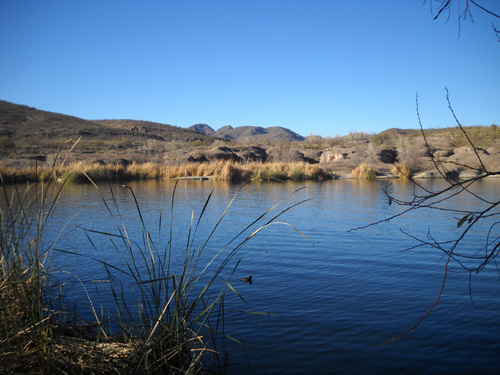 On this visit, however, we were more interested in exploring the natural features in the area: Patagonia Lake State Park (below), the Nature Conservancy's Patagonia-Sonoita Creek Preserve, the large Sonoita Creek State Natural Area, and the Coronado National Forest. 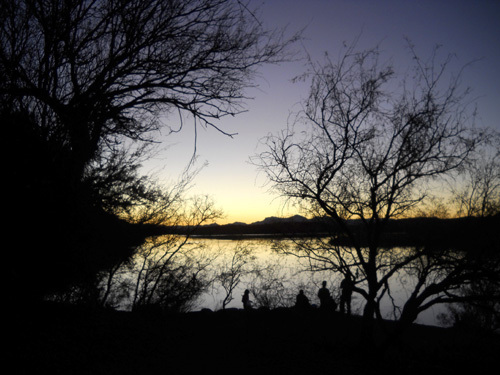 A family is silhouetted against Patagonia Lake and the sky at dusk. Since the directions to potential boondocking sites outside of town were so vague and we had no clue as to the condition of the roads, we decided to camp the first night at the state park, then investigate the boondocking opportunities in just the truck for the remaining nights we decided to stay in the area. 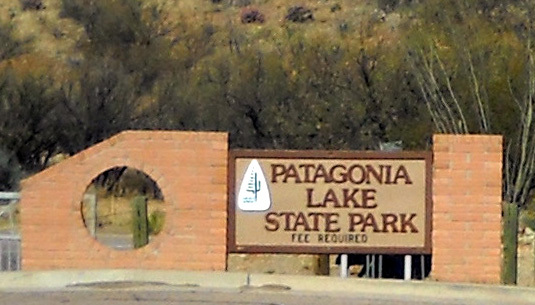 It took us about four hours on Saturday to drive the camper from the Victory Lane Sports Stadium in Glendale (north metro Phoenix) to Patagonia Lake State Park. We got off I-10 at exit 281 and followed AZ 83 south to the town of Sonoita (So-no-ee'-ta), admiring the Santa Rita Mountain Range to the west along the smooth, paved road. We noted that the desert terrain in the area was both hillier and greener than around Phoenix. Green was nice after several weeks of brown! This area is located in a unique transitional zone between the Sonoran Desert (which includes Phoenix) and the Chihuahuan Desert. At Sonoita we turned right on AZ 82, another good paved highway, and followed it south through Patagonia. We caught glimpses of the Whipple Observatory on 8,585-foot Mt. 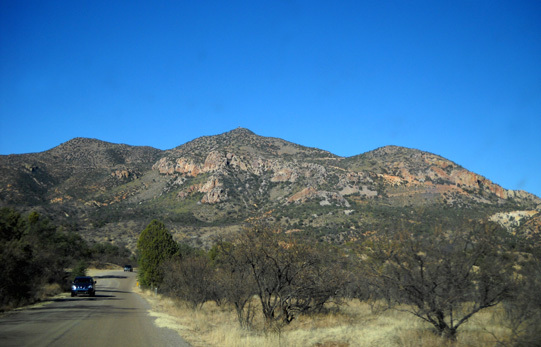 Hopkins to the west and admired the Canelo Hills and Patgonia Mountains to the east in the Coronado National Forest. Six miles south of Patagonia we turned right onto a more narrow, curvy, hilly paved road for about three miles to the entrance of the park. Even on Saturday morning there was little traffic and Jim didn't have any problems towing the camper; he just had to drive slower and allow room for oncoming vehicles. Our views were more limited at lake level (about 4,000 feet) within the park itself but we had those same expansive vistas today while we explored the high trails in the adjacent natural area (off the left side of the photo above). I'll show those photos in the next entry. Although it was a warm, sunny weekend there were plenty of camping spots available when we arrived in the early afternoon. We had talked with park personnel in mid-December and were assured that we wouldn't need to make reservations this time of year. They were right. That might change next winter, however, as Arizona has plans to close many of its state parks. If this one remains open, it may get heavier usage. Lots of day-use folks were using the park on Saturday and Sunday. It is popular for boating, fishing, and birding. 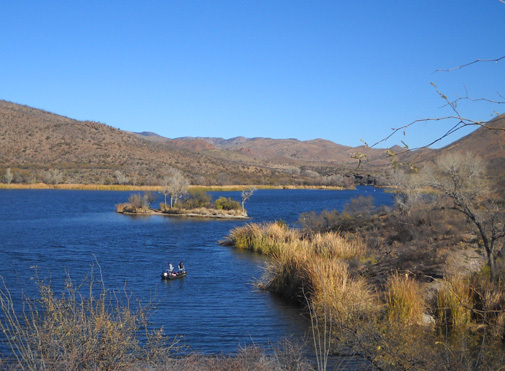 If you look at a map of southeastern Arizona, you won't find very many lakes so almost as many people as birds flock here! Fishermen cast their rods at the southern end of the lake. The park has about three dozen numbered camping sites with water and electric hookups for $22/night and a similar number of "basic," un-numbered sites with no hookups for $15/night. Those prices will probably increase this spring. We chose one of the basic sites because there were more choices in that loop. We had a covered picnic table and a grill right outside our door; see photo below. No one was camped near us the two nights we stayed in the campground. We were able to get fresh water and use the dump station on our way into and out of the park, and used our generator, solar panels, and propane for power -- not as basic as most dry camping we do, but still considered boondocking since we had no hookups at our site. Pretty in pink: the sun paints the clouds over our campsite early one morning. Because the campground is at the base of a large hill, we had poor Verizon cell phone and broadband internet connections at our campsite. I don't think any of the other sites would have been any better in that regard. We were able to get online just fine with Jim's laptop computer by driving up the hill about a mile but I wasn't able to use my desktop computer in the camper. That happens sometimes and we just adapt. We didn't have any TV reception, either (we don't have a satellite dish). We also discovered a major disadvantage -- for us -- to staying in a basic site here: quiet hours in the campground are from 9 PM to 8 AM. That meant we couldn't run our generator for eleven hours. Those hours are longer than in most parks (and where we've usually boondocked, there aren't any restrictions on generator use at all). Even with our solar panels collecting the power of the sun both days, our four six-volt, deep-cycle batteries can't hold power that long, which created various problems for us when we couldn't run the generator to charge them up again. In this park, with those quiet hours, we should have spent $22/night and stayed in one of the sites with electricity. We were simply too lazy to move to one of those the second day and left for various reasons before the third night. Barrel cactus in front of the visitor center at Patagonia Lake SP. 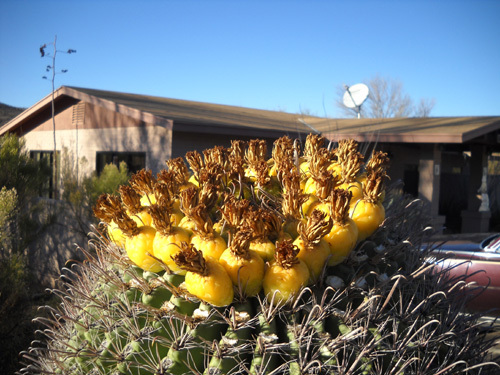 This is the yellow fruit that forms on the top after the bright orange flowers fall off. After setting up the HitchHiker on Saturday afternoon we wandered around the campground and park roads to get a feel for the place. We were able to get trail maps and other information at the visitor center (above), which was staffed by enthusiastic volunteers. We learned about the flora and fauna, geology and history of the area, development of the park, ranger programs, boat rides, and other activities. I'm sorry we missed the sunset boat ride on Saturday night; it was booked up and not offered again during our brief stay. On Sunday we were gone to Fort Huachucha and Sierra Vista and missed the historical and birding boat rides that day. We had plenty of time to admire the lake from the shore and surrounding hills while we were there, however. I especially loved the vivid sunsets over the southwestern end of the lake and have included several sunset photos in this entry. The hills in the distance are in the adjacent Sonoita Creek State Natural Area. I don't know exactly where the sun sets at other times of the year, but this angle creates a very scenic backdrop during the winter months. There is a high, arched wooden pedestrian bridge (below) across the boat access to the marina that leads to a natural rock outcropping above the lake. It almost looked like it was covered in hot lava flow from a volcano. This is a well-known birding area. About four hundred kinds of year-round and migratory birds are here in the winter months. We sure could hear them! It was like living in an aviary for three days. I never did hear the cry of a loon but I loved the surround-sound of the other species in the park. The visitors center has pamphlets that list many -- but not all -- of the birds and butterflies that live or frequent the park and adjacent natural area so enthusiasts can check them off as they spot them. Categories of birds include ducks and geese, quail, loons and grebes, pelicans and comorants, wading birds, diurnal raptors, rails and coots (rails and coots?? ), shorebirds, gulls and terns, pigeons and doves, cuckoos, roadrunners, owls, goatsuckers (another good one!) and swifts, hummingbirds, trogons, kingfishers, woodpeckers, flycatchers, shrikes and vireos, crows and jays, larks and swallows, titmice and verdins, nuthatches and creepers, wrens, kinglets and gnatcatchers, thrushes, mockingbirds and thrashers, starlings and pipits, waxwings, wood warblers, tanagers, towhees, sparrows, juncos, cardinals, grosbeaks, buntings, meadowlarks, blackbirds, orioles, finches and goldfinches . 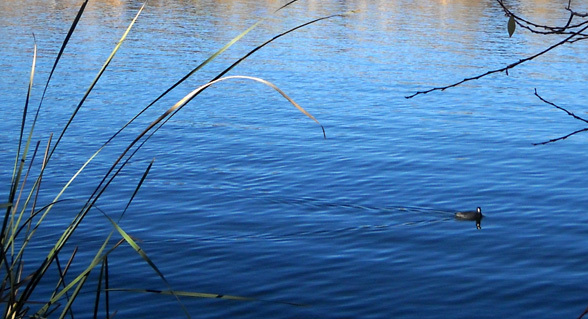 . .
One of the many ducks at Patagonia Lake cuts a V-pattern as it paddles through the water. Each category has from a few to twenty-eight individual species listed. No, I didn't count them all. I've never heard of some of those categories, let alone some of the species within them. One of these years I'll probably become more of an educated bird enthusiast. I already have fun trying to identify as many flowers, trees, and other plants as I can in the places I run and hike. Why not add birds to the list? For real birders, there are also photos and notations in the visitors center of locations within the park where unusual species have been sighted. For some enthusiasts it's a game to be the first to spot a particular kind of bird. There is only one rather short dirt "birding and hiking" trail within the park and I couldn't even find most of it! 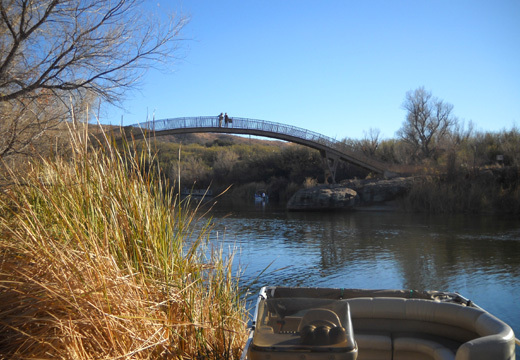 It goes through the hills and marshes at the northeast end of the lake along Sonoita Creek for about 2� miles but becomes difficult to follow after only half a mile. I wish there was a trail surrounding the entire lake, which is also about 2� miles long. On Sunday Cody and I went out for a walk on the birding trail. We soon came up on some free-range cattle that were grazing in the marshes on the shore. They are used to people and let us pass without running away. In another area a bull eyed Cody suspiciously and seemed protective of the females and calves nearby, so we moved more quickly out of his territory. Two mamas and a calf watch us pass. I had read that the ranger-led bird walks wander through the marshes and washes so when the trail disappeared, I just wandered through the trees and as close to the shoreline (below) and creek as I could get without getting into deep mud. The birding trail is aptly named. I heard and saw numerous birds. If you enjoy them, I can vouch that this is a great place to observe them. There were lots of ducks and geese on the lake this weekend. 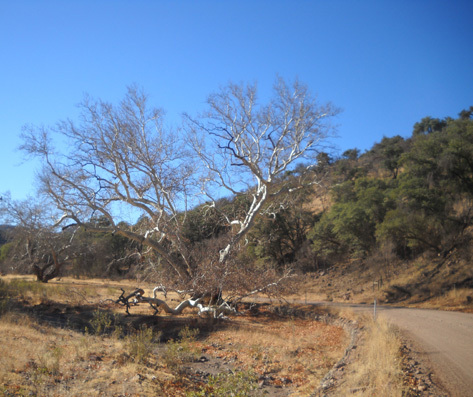 Fortunately for us, there are many more miles of well-marked trails through the adjacent Sonoita Creek State Natural Area. I'll write about that in the next entry. Yesterday morning we took a scenic ride between Redrock Canyon and Red Mountain to the old mining area of Harshaw, about ten miles southeast of Patagonia on paved Harshaw Road. We were hunting for the boondocking sites we'd read about in the blog I mentioned above. We enjoyed the scenery but probably won't ever take our camper back this road. The camping sites that are large enough for a 5th-wheel or Class A motorhome are few and far between, giving us concerns about security. We like our privacy but we feel safer when other folks are camping within sight. In addition, the last few miles of the road are dirt and become increasingly rough. There are quite a few sites along the road and near Harshaw Creek, however, that are appropriate for small trailers, Class B motorhomes, and truck campers. In the next entry I'll show you even larger ones from the natural area adjacent to the park. ANYONE UP FOR A JOURNEY RUN OR HIKE? It took me a few tries but I finally learned how to pronounce "Huachucha" correctly: wa-choo' ka, with soft "a" sounds. I dubbed it "Chewbacca" for fun! Think Star Wars. I learned to spell the name faster than to pronounce it. I've got it now. When we got the bright idea to visit the Patagonia-Tombstone area a few weeks ago, we called Fort Huachucha to see if we could get into their Apache Flats RV Resort on post for a few days in early January. The rate for military retirees is a very reasonable $14/night for full hookups and cable TV (and an even more reasonable $85/week or $300/month). Nope -- booked up all month. Hmm . . . it made us wonder why the place is so popular. To our surprise it was easier to make a January reservation at Ft. Sam Houston in San Antonio -- in our opinion, a nicer campground and area to visit -- than it was at Ft. Huachucha. 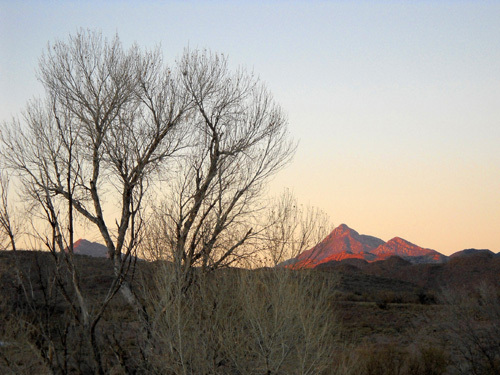 Guess southern Arizona's winter climate trumps southern Texas' winter climate in most retirees' opinion. We tried calling the Ft. Huachucha campground several times after that and had a heck of a time getting a real person on the phone. When we did, she confirmed each time that no one had cancelled their reservation. So we stayed at Patagonia Lake SP instead. We're glad we did this time, although we'll consider Ft. Huachucha if we ever go back to this area. For less money we could have had full hookups, cable TV, and all the services nearby on post. 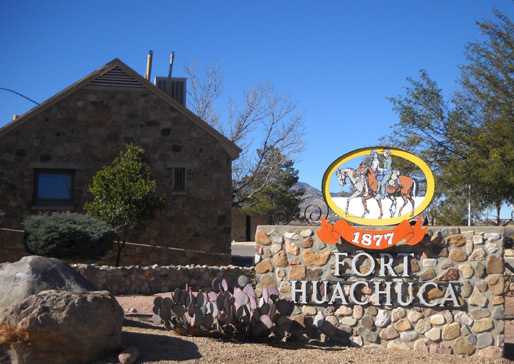 Yesterday we made the 50-mile drive north, east, and south around the Coronado National Forest from the state park to Ft. Huachucha and the adjacent city of Sierra Vista. It was a relatively quick trip in just the truck via AZ 82 and 90, both excellent highways with 65-70 MPH speed limits. 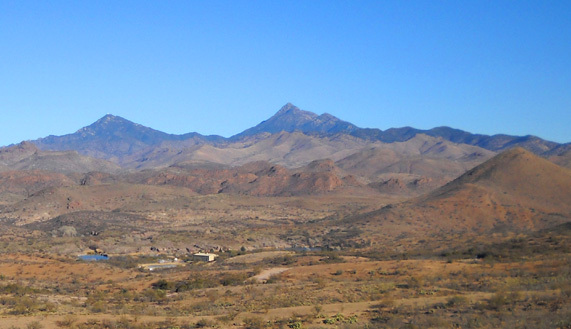 Along AZ 90 we had good views of the Whetstone Mountains to the north and 8,406-foot Huachucha Peak to the south. Entry into Ft. Huachucha was simple and fast with our military IDs. No map was available at the gate and we had some difficulty finding our way around the winding streets on post. We visited the PX and commissary, did laundry much cheaper than at a commercial laundromat, and got a good tour of the post before finally locating the far-flung campground. Other than the weather and the price, we weren't all that impressed with what is (in our opinion) mis-named a "resort" -- fairly crowded gravel and concrete sites, minimal plants, and too many restrictions. Apparently lots of other folks like it but we didn't find it all that appealing. 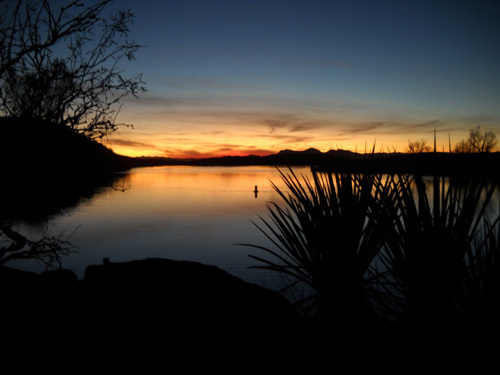 We escaped back to the relative solitude of Patagonia Lake SP without touring Sierra Vista that day. We need to do more investigating about things we'd enjoy doing before returning to that area again. 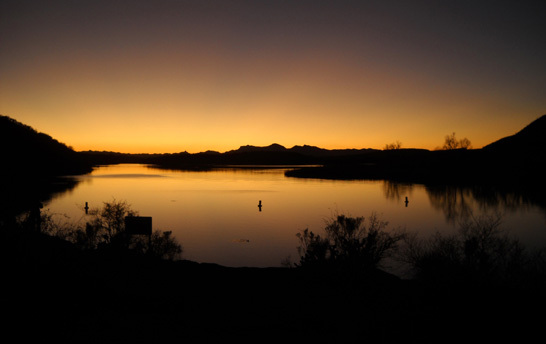 Another dramatic sunset over Patagonia Lake; I almost used this photo for this year's journal headers. For various reasons we decided to leave Arizona a little earlier than planned, forget about visiting Tombstone on this trip, and head for Texas. There will be less to see in Tombstone if we return to the area next winter, however. Arizona plans to close two-thirds of its state parks and historic sites this spring, including historic Tombstone Courthouse. I'll talk about the sorry state of affairs in Arizona's park system in another entry after the state publicly announces specific closures and price increases. The best time we had over the weekend was running and hiking in the Sonoita Creek State Natural Area this morning. We can highly recommend a visit there on foot or horseback. I'll show you what it looks like in the next entry.